On the lead up to the Queens Diamond Jubilee this Sunday, the entire country has gone all patriotic! There are Union Jack Flags flying just about everywhere you look; on cars, on buildings, in windows... even the products on the supermarket shelves have turned red, white and blue! This weekend there will be street parties, carnivals, festivals - you name it! So what could I possibly put on my blog today other than a 'Right Royal Post'? I happen to really like the Queen. She is the only member of the Royal Family who really fascinates me. Maybe it's because she reminds me so much to look at, of my Nan. Or maybe I get it from my Dad. Anyway, I will be celebrating this weekend by spending my first ever day in my NEW Art Studio, which is now finished! Yay!!! 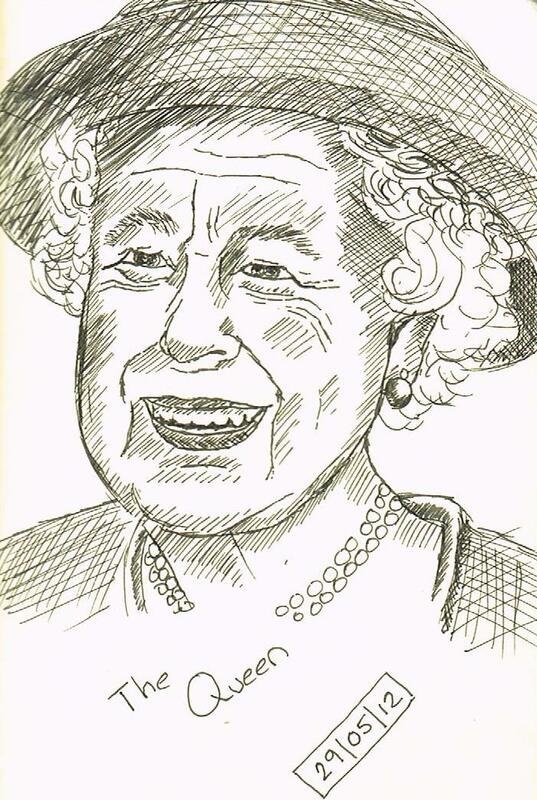 Love your sketches of the queen, Sandra! You've lovingly portrayed her at 86 years young, still "strong of heart and stout of spirit"! Congratulations on your new studio too! Lovely sketches, Sandra! Enjoy the weekend and your first painting day in your new studio!! A little bit of trivia for you - our flag can only be called the Union Jack when being flown at sea, on land it is simply the Union Flag. I too love the Royal family and am feeling very patriotic - I will be putting up my bunting tomorrow and pouring the Pimms lol! I had no idea about that Trudy! Thank you! And have a great weekend! Enjoy the newly improved studio. Lovely picture! And yes she also reminds me of Nanny too. She always has done. I would love verrry much to spend the weekend with Dad as he is so patriotic and enthusiatic but Cowfold Jubilee party on the green beckons. It would be bad form not to be there!! Albeit with a massive umbrella. Teeheehee!!! Poor Dad will be cringing when he reads this, lol! I'm a Royalist through and through. I was lucky enough to fly them around the world for many years - my last flight was 1n 1979 when I flew HM The Queen, HRH Prince Philip and Prince Andrew around Africa for two weeks. They always come across as 'nice' on TV but in fact they are really ...really .. very nice people. Talking of flags, we always flew the flag of the country we were visiting plus the Royal Standard as we taxied in to the dispersal point. Once, in Hawaii, Air Traffic asked, "Ascot 1000, why are you flying flags?" Our reply, "We claim these Islands in the name of her Majesty, Queen Elizabeth the Second!" They replied "'Er.. Roger...copied, Ascot 1000"
HI Sandra, have a wonderful patriotic weekend. Sounds like one fabulous celebration of a weekend! And I agree with Prabal, I love that WC sketch. You really captured her. :) And I really like the flag too. And HUZZAH for a new studio!!! :)) Bet you are loving every single minute of it, can't wait to see the photos. WOW! Sandra, do you ever have a fabulous weekend ahead of you. I can't believe your lads finished already. You MUST post photos. :) I like the queen, too. She seems to be a most truly "royal" royal, if you know what I mean. Thank you Kathryn! First day painting in the studio coming up tomorrow! I can't wait!! Tthe queen is a remarkable woman,intelligent and active. Sketch is fun and have a great celebration. Enjoy that new studio! Brilliant Sketches Sandra. I'm flying the flag too this weekend ... literally. Wow, magnificent sketches. She looks great! Very happy. Sandra. Felicidades a la Reina y también a tí por ser inglesa. Espero ver pronto las fotos de tu estudio. Para un artista el estudio es "su mundo"
Love your studio below too! I love those shoes in your banner! Joined as a follower as soon as I saw them! Your Queen(s) are quite wonderful too. Love your style very much! Happy Sunday sketching. Thanks for visiting me and the naughty Doodly Birds Sandra. It would appear that I have no control over them. I hope they are better behaved when they fly off to new homes. It's lovely to have you following along. I have to agree with Pat. 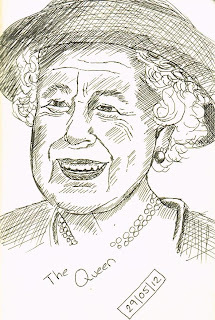 The excitement and energy of the jubilee is seen in your drawing. What a great way to remember it.